Ma began racing in karts when he was eight and won the national Chinese youth karting championship four years later. In 2004 he moved in to single seaters in the Asian Formula Renault Series and won the championship, before going on to represent Team China in A1 Grand Prix the following year. 2006 saw Ma competing in Formula Renault 2.0 before he moved up to Formula Three - initially in Spain as he took three podiums and then in 2009 he entered a number of British Formula Three International Series events. 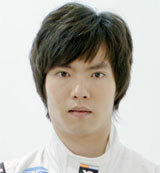 Two races for Team China 2010 Superleague Formula followed, and then in 2011 he won the Chinese Touring Car Championship. 2012 saw him announced as the first member of the HRT driver development programme, with his first taste of Formula One machinery coming at the Silverstone Young Driver Test in July. After a solid job at Silverstone, Ma made history as the first Chinese driver to appear at a grand prix weekend when he drove in FP1 ahead of the Italian Grand Prix. He took part in three other FP1 sessions for HRT that year but the team collapsed over the winter and in 2013 he took his money to Caterham. He made his FP1 debut with the British team at his home race in China.